I had a completely stuck mash when brewing a couple of days ago and I was wondering if anyone had any tips for avoiding them. This follows a couple of very slow run offs from the mash tun in previous brews. In all three brews I had to blow up the tap via a tube to get a flow going. In the last brew I had to empty the mash tun and re-fill it in order to get any flow going, after which it was very very slow. Just as a bit of background, the grain bill was 4.1 kg of pale malt and 300 grams of crystal mashed in 12 litres approx of water at about 66 c. I used batch sparging and tried to run off the the wort first before adding more water but it was stuck, so I thought I would add sparge water at about 80 c to see if the would help by diluting it a bit and stirring, which it didn’t. Therefore had to empty boiler at this point. Very annoying. After this has only a very slow trickle and had to keep blowing into the tap via tubing to get any kind of flow. Since I had got a flow at this point and did not want to risk another stuck mash I just fly sparged from this point. Would like to know how this affected my OG but I managed to break my thermometer!! 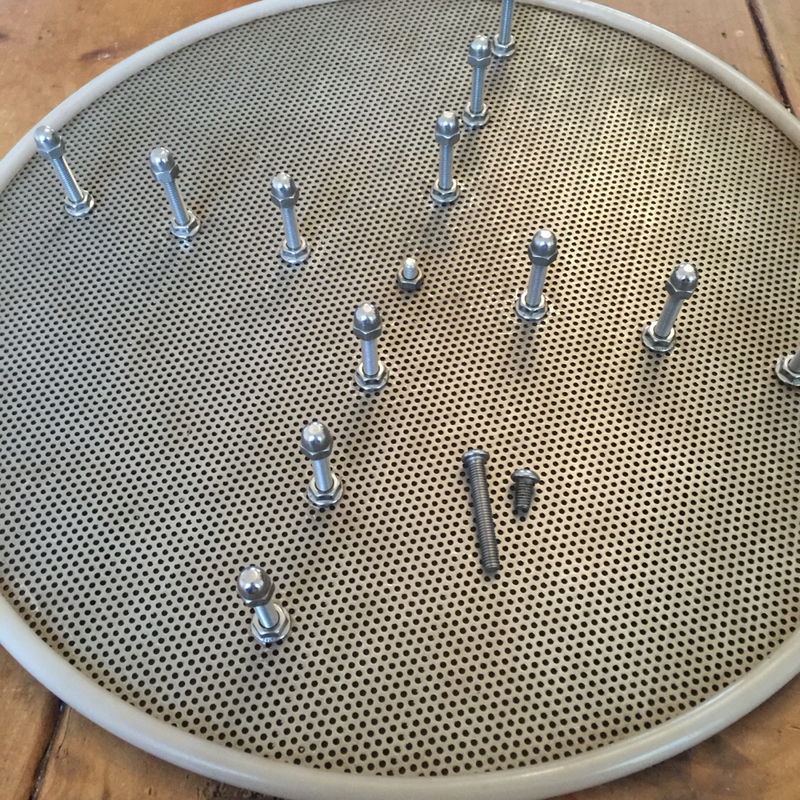 I use a false bottom in my stainless steel mash tun, which is connected to the tap via plastic tubing provided with the fake bottom. I have no idea where I got the false bottom from, as must have bought at some point in ten year break I took from brewing. When I used to brew I used to mash in a fermenting bin with holes drilled in the bottom, which was placed in another bin. No problems with stuck mashes then. Last edited by bitter_dave on Sat Aug 11, 2018 9:47 am, edited 1 time in total. ... managed at attach the photos to the previous post without realising! Apologies for the top one being upside down for some reason! On the top photo I wanted to show the depth of false bottom. Did not seem very deep to me, and wonder if this was not helping, but then I've never seen one before so have no idea if this is normal. The second photo shows the tap, which I bought from hop and grape and is used on their mash tuns so should be fine. Bottom photo obviously shows the inside of the mash tun. The mash tun was bought years ago when I intended to return to brewing. It was bought from a company that used to be called nordic optical as a bain marie rather than a mash tun (lots of people bought them on this forum). It is excellent at retaining heat and the flow through the tap when there is no grain in there is no probs. Hmm, has this only just started happening? Have you had good run offs from this mash tun before? Here's my first thought, sorry if it's an obvious one, but are you opening the tap on the mash tun really slowly to start with? Hi Guy, thanks for replying. Only done three brews in this mash tun, all of them problematic with run off. Only returning to brewing after break of a decade and used to use adapted fermenting bin method with holes drilled in inner bucket, and had no probs with run off in the old days. The false bottom and runoff tube look good, no reason why they would cause a stuck mash. Except (! ), is there any way the grain could be getting under the false bottom before you begin the run off? This would seriously clog things up and explain why blowing through the tube helped a bit. There's no seal round the edge of the false base, so this could be the problem. Mine has plastic tubing all round it which has been slit lengthways and pushed on. Others don't have this, so perhaps it's not essential. Opening the tap too fast can block the holes, though. It needs to be opened really slowly for the first half litre or so, then can be slightly increased. Your first litre or so will be going back into the tun anyway. I work on a flow rate from the tun of a maximum of 0.5l/min during the sparge, far slower for the first litre or so until the wort runs clear. Your previous kit was probably a little more forgiving! Did you stir the mash before trying to run it off? If you did, this could have easily blocked the holes in the false bottom. Hello, as the last comment said it should seal around the edge of the mash tun, there should also be a space underneath the false bottom for the wort to drain through. You could try a larger diameter false bottom, split tubing to seal and stainless steel bolts to stand off the bottom. Chuck some washed rice hulls or oat husks to make sure it’s not your crush which is too fine. They are cheap and washed will have no impact on your beer. Those thermopots are great with deck drains in the middle, fiddly to install, I’ve done 3, but as others have said have a large space above the drain especially if you are considering herms long term. I bought an expensive plate off Mr Lard and it’s perfect. I had a similar problem a while ago with a very similar false bottom. A very frustrating brew day which saw me scooping out the mash into a muslin bag and making a temporary straining bucket. Fortunately the resulting brew was very good. I eventually realised the problem was to do with not enough space underneath the dome so the bottom of the threaded stainless connector was sealing against the bottom of the mash tun. I had a threaded elbow going through the dome with a nut underneath. I fixed it by putting a stainless washer above the dome, just under the elbow, lifting the bottom of the "pipe" up by 1 or 2 mm. This did the trick and it hasn't been a problem since. Edited to explain it better after looking at my setup. Perhaps the drain off tube is touching the bottom with the weight of grain on it, try cutting a slot in side of it so even it touched the wort can get through. I had something similar happening with my false bottom with the silicon hose fitted like you had. I also used to get lots of grain coming through because also like you you have not got a silicon seal around the false bottom. I cured the grain getting through which was causing not a stuck mash but just the grain blocking the pipes by doing the following. I replaced the silicon hose attached to the false bottom with a piece of stainless tube. This was cut to length and attached using stainless fittings. The tube i very slightly bent downwards so that when fitted it forced the false bottom to push tightly against tje bottom of the mash tun. This totally cured the problem. I know of someone else that has has an identical issue with an identical setup. Given that the difference between his (& your) setup is that I have a very similar domed false bottom, but with a bottom drain, we figured the problem was either an airlock in the tube, or that the silicon tube is getting squashed by the grain, causing it to seal up. Try this - put some water in the tun before you add grain, and then open the tap so you get some liquid into the silicon hose and flush out the air, then close the tap and dough in as normal. The liquid in the hose should stop it collapsing under the weight of grain. The proper solution is to use a rigid tube. Thanks Jocky - that makes perfect sense. I will investigate putting a rigid tube on as a more permanent solution.